Check for leaks and drafts around the house. Replace weather stripping and re-caulk around doors and windows. Drafty doors and windows will cool off the house and cost you money in heating bills. Inspect your attic’s insulation. Heat rises so adding good insulation can keep the heat from escaping. Check your heating system. Sometimes something as easy as replacing your filter or having simple maintenance done can save on heating costs. Consider changing from standard light bulbs to energy saving bulbs. Winter uses a lot of your electricity so even saving a little here and there will help. Whether you live in a warm or cold climate, take this opportunity to inspect your home systems. You’ll be money ahead in the long run! For many of us, going to see local holiday light displays is a favorite yearly tradition. It’s a great way to jump-start your holiday spirit! So bundle up, jump in the car and spend an evening taking in some of these great holiday lights. The Way of Lights in Belleville is one of the area’s most popular Christmas displays. More than a million lights are used to tell the story of Jesus’ birth. You can drive through the display or take a carriage ride. There’s also a puppet show, camel rides, an indoor Christmas tree display and an interactive play area for the kids. The Way of Lights is open Monday through Thursday from 5 p.m. to 9 p.m., and Friday through Sunday from 5 p.m. to 10 p.m. Admisson is free, but donations are accepted. It takes quite a while to see the 35 acres of Christmas lights at Santa’s Magical Kingdom in south St. Louis County. Millions of lights and dozens of holiday scenes fill Jellystone Park in Eureka. You can see Santa’s flying reindeer, travel through the Candy Cane Village or visit the Waterfall of Lights. For even more fun, take an old fashioned wagon ride through the display. After seeing the lights, head over to Kringle’s General Store for a little holiday shopping. Santa’s Magical Kingdom is open from 5:30 p.m. to 10:30 p.m., Sunday through Thursday, and 5:30 p.m. to 11 p.m., Friday and Saturday. Admission is $20 per car or $13 for wagon or train rides. See the Anheuser Busch Brewery in St. Louis all decked out for the holidays. The brewery is hosting free walking tours, along with free samples of AB products during Brewery Lights. There are also food stations, a s’mores station and a special VIP holiday package. The display is open daily from 5 p.m. to 10 p.m. Walking tours are not available on Thanksgiving, Christmas Eve, Christmas or New Year’s Eve. For 30 years, employees with the St. Louis County Parks Department have turned Tilles Park into a Winter Wonderland. You can drive through the display, but the best way to see the lights is by horse-drawn carriage. Winter Wonderland is open daily from 5:30 p.m. to 9:30 p.m., except for Christmas Eve and New Year’s Eve. Cars are welcome Sunday through Friday, but Saturdays are reserved for carriage rides. Admission is $10 per car. Tickets for carriage rides are available through MetroTix, and prices vary depending on the size of the carriage. The holiday season begins in Downtown St. Louis with the Macy’s Holiday Festival of Lights. Crowds gather at Union Station to watch the lighting of the Christmas tree and downtown light display. The evening ends with fireworks and a special visit from Santa Claus. The event runs from 4:30 p.m. until 7 p.m. Hundreds of thousands of lights will decorate the Missouri Botanical Garden for the holidays. Walk through the light display, then take in the Victorian Christmas decorations at Tower Grove House. Garden Glow also has live holiday music, snacks and shopping. Garden Glow is open most evenings during the Christmas season from 5 p.m. to 9:30 p.m. General admission is $16 for adults and $10 for children. The price for adults increases to $18 after December 18. Go a little wild this holiday season with Wild Lights at the St. Louis Zoo. If you’ve never been to the zoo on a winter evening, this is a real treat. Walk through the exhibits as they come alive with more than 500,000 lights. Kids can hear holiday stories and adults can do a little shopping at the Holiday Zootique. Wild Lights is open from 5:30 p.m. to 8:30 p.m. Weekday tickets are $7 for Zoo members and $8 for non-members. Weekend tickets are $9 for Zoo members and $10 for non-members. Children under two get in free. There is also free parking at the Zoo’s north and south lots. Each year, Alton’s Rock Spring Park twinkles with three million lights during the holiday season. You’ll see cascading waterfalls, lighted trees and dozens of magical displays. Kids can also visit Santa in the Enchanted Forest or get up close with goats, llamas and other animals at the petting zoo. Christmas Wonderland is open Monday through Friday from 6 p.m. to 9 p.m., and Saturday and Sunday from 5 p.m. to 9 p.m. Admission is $7 for cars and small vans, or $1 a person for vehicles with more than 10 people. You can also take a carriage ride through the display. Another option for holiday lights in the Metro East is the Winter Wonderland of Lights in Lebanon, Illinois. Colorful lights and hand-painted scenes are used to create a Victorian style holiday show for the whole family. The drive through display is set up at Horner Park in Lebanon. That’s about 30 minutes from downtown St. Louis. Winter Wonderland is open Sunday through Thursday from 5 p.m. to 9 p.m., and Friday and Saturday from 5 p.m. to 10 p.m. Admission is free, but donations are accepted. You find all kinds of Christmas scenes at the Celebation of Lights in O’Fallon, Missouri. Each year since 1991, visitors have enjoyed taking in the holiday lights at Fort Zumwalt Park. This is primarily a drive-though display, but you can also take a carriage, train, segway or sleigh ride through the park. There is also a walk-through night on Tuesday, December 8. Celebration of Lights is open Sunday, Tuesday, Wednesday and Thursday from 6 p.m. to 9 p.m., and Friday and Saturday from 6 p.m. to 10 p.m. Monday is for train and segway rides only. Admission is $10 for cars and $15 for large vans. Tuesday is discount night where all cars, vans and non-commerical vehicles are $7. Holiday Night Lights is a drive through display set up each year at Rotary Park in Wentzville, Missouri. The display takes you through a mile-long wonderland of twinkling lights. Holiday Night Lights is open from 6 p.m. to 9:30 p.m. It’s open Thursday through Sunday from November 27 to December 13, then daily (except Christmas Day) from December 17 to December 30. Admission is $8 for cars with up to six people, and $1 per person for vehicles with seven or more people. Create Space. Many of today’s buyers are looking for open rooms. Consider removing unwanted walls to make your home feel more spacious. Buyers will often pay a premium to get a bit of extra room. Replace Flooring. Get rid of that old carpet in the den and replace it with today’s newer hardwoods and laminates. You don’t have to spend a lot to make a big impression! These simple tips can help you sell your home and take advantage of our today’s market. Please contact us if you have any questions about selling your home. We are here to help! You won’t generally turn the headphones down for any version of “The Little Drummer Boy,” but it’s that legendary Bing Crosby-David Bowie duet that sits in the pantheon of eternally listenable Christmas tunes. Originally written and performed by the Vince Guaraldi Trio for 1965’s A Charlie Brown Christmas, this melancholy melody falls on the listener like a light snow — a lovely, welcome distraction. There are plenty of great Motown Christmas classics that have been radio staples for decades, but it’s hard to top this bouncy 1967 Stevie Wonder track. That’s probably why it’s been covered by everyone from Hanson to Cee Lo Green. At a mere two minutes and six seconds, this energetic 1989 single by punk icons the Ramones is a welcome antidote to those seemingly never-ending, “12 Days of Christmas” types of holiday songs. It’s hard to turn the dial when a broken-hearted man is pleading his holiday heart out. First recorded by R&B singer Charles Brown in 1960, a cover by the Eagles climbed the charts almost 20 years later. It might be the most difficult Christmas song to sing along with, but that doesn’t stop millions from trying, even if they’re alone in their car and hopelessly lacking in harmonizers. A hit for the Pretenders in 1983, this dreamy ballad was written as an ode to the band’s late guitarist James Honeyman-Scott, but its lasting appeal seems to be for listeners spending the holidays far away from someone they care about. No Christmas is complete without sold-out performances of Tchaikovsky’s The Nutcracker, and no portion of that ballet captures that magical innocence of the season quite like this one — immortalized in roughly 8,000 TV commercials, and yet still easy on the ears! Christmas music could use a little more funk, and James Brown was kind enough to provide it. When the Godfather of Soul addresses St. Nick directly, we all win. “Peace on the earth, goodwill to men” is not a sentiment that’s likely to outlast its welcome, no matter how many people you had to elbow your way around to get your kid the new Elmo doll. It might stand in stark contrast to the majestic tone of some other entries on this list, but this playful 1981 single by the Waitresses — a little-known New Wave band from Akron, Ohio — has stood the test of time largely thanks to singer Patty Donahue’s relatable, down-to-earth telling of a girl looking for a holiday love. Just another in a long line of “holiday hits” written by clergymen in the mid 19th century. Hundreds of beautiful renditions have been recorded over the years, but just try to listen to the Beach Boys’ 1964 version without getting goosebumps. Sure, at its core it’s a silly kids song. But whether it’s the boundless enthusiasm of a pint-sized Michael Jackson & the Jackson 5 or a jean-jacket-era Bruce Springsteen having fun with the E Street Band, this one never gets old. While the original Bing Crosby recording captures the heartbreaking daydreams of a GI in World War II, this song remains the gold standard for the experience of Christmas in any wartime, whether it’s a soldier in 1940s Germany or 2013 Afghanistan. One of the most beloved and oft-recorded Christmas songs of the past 30 years, “Fairytale of New York” keeps its charm after 100 listens, thanks to the unbridled folk energy and unorthodox, rough-and-tumble characters created by the Pogues and Kirsty MacColl. When it comes to the non-secular brand of Christmas standards, it seems like just about everyone is united in their undying admiration for “O Holy Night” — a legitimately moving epic adapted from a French poem in 1855. From the moment Judy Garland first warbled it in 1944’s Meet Me in St. Louis, we were hooked. No other Christmas song combines joyous lyrics and a somber, wistful tone in quite the way this one does. But of course, if you’re going to name the one Christmas song that nobody ever has gotten sick of, it might as well be the number one selling song of all-time. And yes, that’s “#1 selling song, ” not “#1 selling Christmas song.” Written by Irving Berlin, “White Christmas” has been covered by everyone from Bob Marley to Bette Midler, and Kenny Rogers to Taylor Swift. 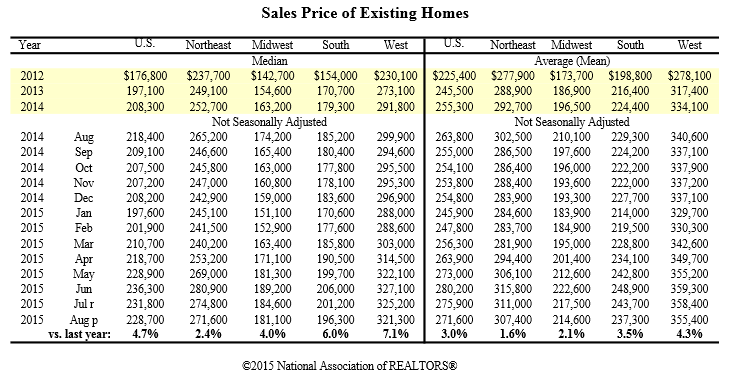 Existing–home sales came back strongly in September following a decline in August and have now risen year–over–year for 12 months in a row, according to the National Association of Realtors® (NAR). All four major regions saw sales gains in September. Total sales of existing homes (transactions for single–family homes, townhomes, condominiums and co–ops) grew 4.7 percent to a seasonally adjusted annual rate of 5.55 million in September from a slightly downwardly revised 5.30 million in August, and are now 8.8 percent above a year ago (5.10 million). September’s median price for existing homes (no new construction) was $221,900, or 6.1 percent higher than a year ago ($209,100). This represents 43 months of year–over–year growth. Total housing inventory by the end of September dropped 2.6 percent to 2.21 million existing homes, or 3.1 percent less than the inventory a year ago (2.28 million). Unsold inventory holds a 4.8–month supply at the current sales pace. The share of first–time buyers dropped to 29 percent of overall sales after a rise to their highest share of the year in August (32 percent). Freddie Mac data shows the average commitment rate for a 30–year, conventional, fixed–rate mortgage stayed below 4 percent for the second consecutive month. A year ago, the average commitment rate was 4.16 percent. Properties remained on the market 49 days in September, a bump from 47 days in August and 56 days a year ago. Short sales sold in 135 days in September; foreclosures sold in 57 days while non–distressed homes required 48 days. Distressed sales — short sales and foreclosures — stayed at 7 percent in September for a third month in a row; a year ago, they were at 10 percent. Six percent of September sales were foreclosures and 1 percent (lowest since NAR began tracking in October 2008) were short sales. Holiday entertaining can be a great joy – a festive time to get together with family and friends, showcase your holiday decorating skills and celebrate everything the season means to you. With these party planning ideas, you can throw the perfect holiday party – whether you have an over-sized family room or a small apartment for entertaining. The key is to be creative with what you have, and plan, plan, plan! Set the tone for your holiday party even before the first guest arrives. Fill a baking pan halfway with water and cinnamon; then put it in the oven on a low heat, and let the aromatic smell of cinnamon fill the house. Plug in the holiday lights to cheer guests as they arrive. Have seasonal music playing softly in the background. Keep a fire burning in the fireplace to add to the cozy holiday mood. There is nothing worse than not having a place to sit at a party! Make your guests’ comfort a top priority at your holiday celebration. You can borrow chairs and benches from friends. Depending on the formality, you can throw down some beanbag chairs or oversized cushions, which work great for kids. If you lack a large open area to seat everyone, arrange small seating areas separate from one another. Truth be told, most guests would prefer these intimate seating areas anyway! To hold guests over before the meal is ready, offer plenty of appetizers and finger foods. These can include cheese and crackers, prepared veggie platters, cocktail shrimp, chips and salsa, fresh fruit, mozzarella sticks, sandwich quarters, etc. Add elegance to your hors d’ourves by lining each tray with colorful holiday foil and doilies. Know when you’re going to serve the holiday meal, and make that clear to your guests. For the main course at your holiday party, you can go with a traditional ham, turkey or lamb… or opt for lasagna, subs or even pizza. It’s your party, so do things your way. As far as beverages go, you can satisfy most guests with a variety of juice, soda and alcohol — or why not combine all three in a killer holiday punch? And don’t forget the egg nog! Don’t forget dessert! If you are clever enough, your desserts can double as decorations. Picture this: rich, chocolate fudge brownies, drizzled with dark chocolate syrup and stacked delicately among chocolate-covered strawberries beneath the flickering silhouette of a red taper candle. Delicious and eye catching! Other desserts that are great for display are holiday cookies, apple pie, chocolate cream pie and cheesecake. Or you can take the easy way out… and hire a local caterer! If you want guests to stay awhile instead of taking off early, then keep the party alive with games and activities. Plan a holiday gift exchange — or better yet, a joke gift exchange. You may want to put a dollar limit on the gift so it’s not a burden on your guests. Fill out a few Mad Libs, or try creating your own with guests at the party! Announce that you’re hanging up the mistletoe to stir things up. Dust off the chess table, break out the poker set, grab Pictionary. You can even look online for icebreaker games that might be appropriate. But keep in mind, there will be those who would rather mingle than play games, so let the guests dictate their own entertainment schedules. Shopping around for a home loan or mortgage will help you to get the best financing deal. A mortgage – whether it’s a home purchase, a refinancing, or a home equity loan – is a product, just like a car, so the price and terms may be negotiable. You’ll want to compare all the costs involved in obtaining a mortgage. Shopping, comparing, and negotiating may save you thousands of dollars. The US Department of Housing and Urban Development offers a free brochure to help guide you through this process. The holidays can be a joyful time, offering a chance to reconnect with friends and family. But they can also be stressful. You may feel pressure to buy and give gifts. Maybe you are worried about money. The holidays can also be hectic. There never seems to be enough time to get things done. Think about the kinds of events that trigger stress for you during the holidays. Then you can focus on one or two things you can do that will help the most to reduce stress. Know your spending limit. Lack of money is one of the biggest causes of stress during the holiday season. This year, set a budget, and don’t spend more than you’ve planned. It’s okay to tell your child that a certain toy costs too much. Don’t buy gifts that you’ll spend the rest of the year trying to pay off. Share the tasks. You don’t have to do everything yourself. Share your “to do” list with others. Spend time with friends and family while you share tasks like decorating, wrapping gifts, and preparing the holiday meal. Learn to say no. It’s okay to say “no” to events that aren’t important to you. This will give you more time to say “yes” to events that you do want to attend. You may not be able to avoid stressful situations during the holidays. But you can plan to respond to them in a healthy way. As days get shorter and weather gets colder, we retreat indoors to the warmth of our homes and hearths. If you have a fireplace, fall is a great time to make sure the chimney and flue are in good working order. If your assessment uncovers any issues that gives you pause, call in a chimney professional to diagnose the problem before it gets big, expensive, and potentially dangerous. Visually assess the chimney from the outside. Is it leaning? Are there any chipped bricks or masonry joints? Do you see any cracks or holes? If your chimney is factory-built metal, look for any corrosion, stains, or loose sections. If your chimney is exposed to your attic, make sure to check there, as well. Look for any signs indicating that repairs are necessary. A good cap can reduce damage caused to a chimney by water and wildlife. Rain and snow can enter an uncapped chimney and subsequently freeze and thaw, causing expansion damage. Small wildlife can nest in chimneys, clogging them and potentially introducing fleas, ticks, worms and other disease-causing pests into the home. A chimney cap with screen mesh will keep animals out, while shielding your roof from embers and sparks. Inside the house, check the area around your chimney for any stains or dampness. These could be caused by faulty flashing around the chimney at the roof line, or by a damaged flue liner. If you see signs of water around your chimney, call a chimney professional right away. Open the clean-out door from the base of the flue, located either in your basement or outside the house. Using a small mirror and flashlight to see up the flue, look for buildup of soot and also any cracks, holes, or separations. If in doubt, give your chimney professional a call for a good checkup and cleaning. Check the brickwork in your fireplace for wear. Check the damper, as well—it should open and close easily. Look into the smoke chamber above the damper to see if it has a buildup of soot. Again, call your chimney professional for service if you see any of those telltale signs. Chimney safety should be a high priority for every homeowner. 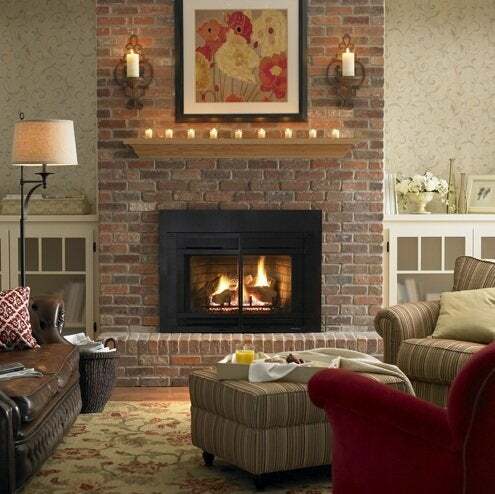 With regular maintenance, your fireplace and chimney can give you years of wonderful service. A chimney professional can spot things that even a diligent homeowner could miss. Call on a pro to do regular cleanings and safety checks as a part of your home maintenance routine. Then throw another log on the fire, sit back, and enjoy.